Notes on a visit to Clairwood Hospital, 19 May 2001. 1. Sindisiwe Jeza (girl age 10) - 50 % burns, both legs, hands, body - paraffin flames. She cannot walk but gets physiotherapy everyday. She is not attending school as she cannot walk and doesn't have anything to keep her busy with. We gave her a toy that can move arms, and the joy on her face was unbelievable. Dr. Soila is treating her. Her mother visits from time to time when she has money. The mother is unemployed, has two other children, is unmarried and does casual jobs. The only contact details are: Box 443, Mathubathuba, c/o Msweli Store Mathubathuba is near Empangeni in KwaZulu Natal. 2. Mbali Ndamane (2 years) was badly injured when a candle fell on the mattress she was sleeping on. Her mother abandoned her, but her grandmother is taking care of her, together with her father. The grandmother has two other young children to care for at home. The nursing staff say that the father phones everyday, but no-one visits her. The only contact details we have is: c/o Mbango Store, Weenen. Msinga Hospital refered her. She is treated by Prof. Youngelson. 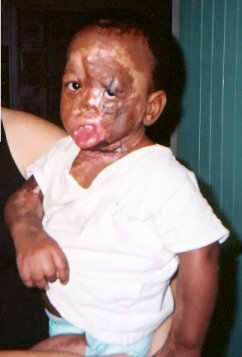 The other children in the ward were less severely burned. 6. Geinikhaya Makhalima - (30 months - boy) - he was admitted on 17 May 2001. Boiling water from kettle on face and body - looks really bad! 7. Siyanda Mthemba (19 months girl) - a bright little girl. She is there for skin grafts on her hands, releasing the fingers. They had already done one hand. The other hand's fingers are fixed in a fist and will be operated on next. Her face has already healed and she was injured in a shack fire. Her mother visits. 8. Ntokozo Gumede (25 months - girl) She pulled a basin of hot water onto her face and neck but has healed well. 9. Baphilile Bekway (12 years - girl) Severe contractions to neck - in process of skin release. She was injured in October 2000 with hot water. Attends the hospital school in C4. Social workers claim to have struggled to contact any relatives. No-one visits her. She was refered by Edendale hospital (not Edenvale Hospital, Gauteng, apparently). 10. Noluvuyo Nlayiyana (7 years - girl) She is an epileptic and fell in a fire during a fit.